This week saw the launch of a new magazine for makers, tinkerers and garden shed engineers. “HackSpace Magazine” aims to be more than just electronics and incorporates woodwork and metalwork too. The first edition will be on sale later this month but you can order a free copy by signing up to their mailing list. Editor Ben Everard is well qualified for the job having worked with Linux Format and Linux Voice prior to HackSpace Magazine. He contacted me earlier in the year and asked me to produce a tutorial involving electronics and woodwork. So you too can see how make a BlueTooth controlled Christmas light display! Also featured is an interview with top maker Becky Stern, a project to build a trebuchet, Boldport electronics and a column from maker and robotwars judge Dr Lucy Rogers. 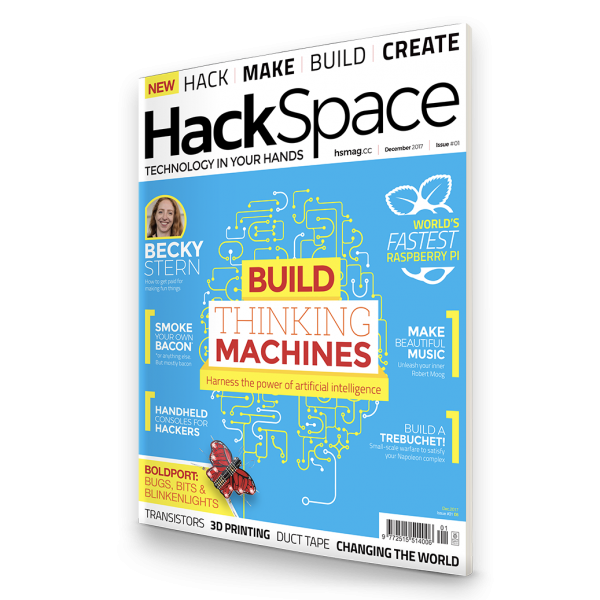 Most of the makers on Twitter seem to be excited about the new magazine but there are a few worried that the proposed trademarking of the name could cause problems for Hackspaces. There’s also concerns that it might also get confused with the unconnected Hackspace Foundation who look after the interests of Hackspaces around the UK. I’m looking forward to seeing the magazine and have ordered my copy.